A goal to be pursued constantly during labour is preservation of fetal well-being by early detection and relief of fetal distress. Fetal monitoring includes surveillance of fetal heart and uterine activity by an electronic device in which the ‘Ultrasound Doppler Principle’ is used. The transducer is placed on the maternal abdomen at a site where fetal heart action is best detected. A coupling gel may be applied because air conducts ultrasound poorly. 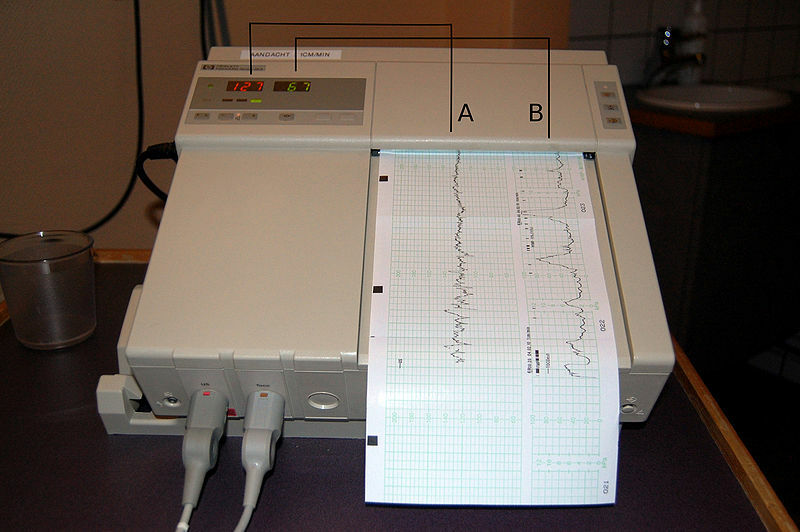 These signals are edited electronically before fetal heart rate data are printed onto a bedside monitor tracing paper. The average fetal heart rate in the third trimester ranges between 120 to 160 beats per minute. Bradycardia comprises a baseline fetal heart rate under 120 beats per minute that lasts 15 minutes or longer and severe bradycardia is less than 80 beats per minute for three minutes or longer. Tachycardia is mild if baseline fetal heart rate is between 161 and 180 beats per minute and severe if more than 180 bpm. Decelerations are decrease in fetal heart rate below baseline rate. They may be early, when there is a drop in heart rate with uterine contractions as is related with cervical dilatation(and can be considered physiological) . Compression of fetal head produces variable decelerations (or due to umbilical cord occlusion). 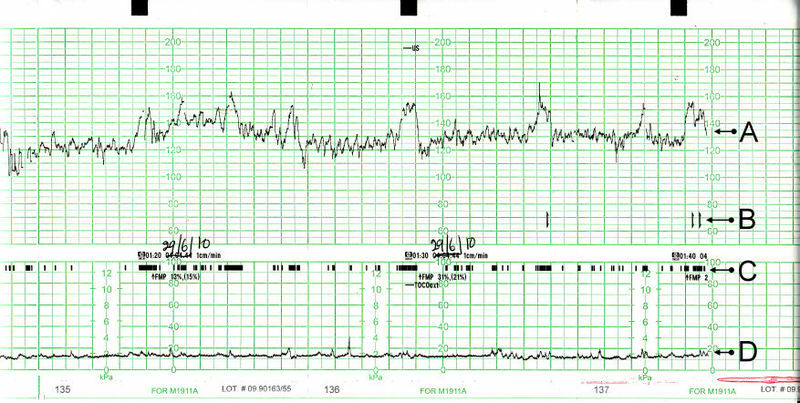 The late deceleration is a symmetrical decrease in fetal heart rate beginning at or after the peak of the contraction and returning to baseline only after the contraction has ended. 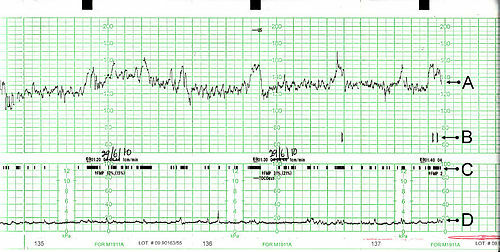 Late decelerations are uniform in shape and typically begin 30 seconds or more after the onset of contractions Hence, the CTG (cardio-toco-graph) is an important aid to the obstetrician for deciding fetal distress of the woman in labour so that timely action (and delivery by C-Section) can be done to safely deliver a healthy, uncompromised baby.